With the Product Kits app, you can keep a track of the inventory of your raw material which is used to make your final product. The Product Kits app will help you to manage the inventory of the final product and the raw material products simultaneously. You can calculate the number of units(in their respective measurements) of the final product which can be made using the inventory of the raw materials available. You can also easily hide the raw material products from your online store so that the customer will only see the final product and the raw materials individually which are used to make the final product. You can simply hide all the child products from the sales channel and it will not affect the bundle and the inventory calculation in any case. Be a bakery, a cosmetics company or a yarn selling company, the Product Kits app can be utilized as per many use cases. Let’s say you sell tea bags in packs like 50 gms, 100 gms, 250 gms and you have a raw inventory of 10 KG Tea and you would like to calculate the final inventory, i.e., the number of 50 gms, 100 gms, 250gms packs that can be made with the available raw material. IMPORTANT NOTE – While considering the measuring units to calculate the inventory you need to choose the least unit to measure. In terms of weight it will be grams, volume it would be ounces and fluids it would be ml. In this case, it is grams. As the raw material is 10 KG, converting it into grams would be 10,000 gms. Now, let’s calculate the number of packs that can be made with the above raw material. So now, let’s implement the same in our Product Kits app. So to create a bundle you need a child product and a master product. So, in this case, we need to choose the child product in such a way that the inventory is managed within this product. Also, the metric you choose should be of the least unit. In the above calculation, if you take a closer look, the least quantity is 50 GMS and the rest are just the multiples of it, i.e., 100 GMS packs can be split into – 2 x 50 GMS pack, 250 GMS pack can be split into 5 x 50 GMS pack. So now the child product will be TEA BAG – 50 GMS and the inventory will be 200. So every time you have your raw material, you need to make them into 50 GMS pack and then calculate the inventory. The rest, the Product Kits app will handle. Create a child product TEA BAG – 50 GMS with inventory 200. Sell the products individually as different packs. Now in the Product Kits app, choose the master product as Tea Bag 100 GMS and select the child product as Tea Bag 50 GMS and enter the quantity as 2. Same is the case with Tea Bag 250 GMS, but here the quantity is 5. Sell all the packs under 1 products with a drop down. Create a master product Tea Bag Bundle with variants – 50 GMS, 100 GMS, and 250 GMS. 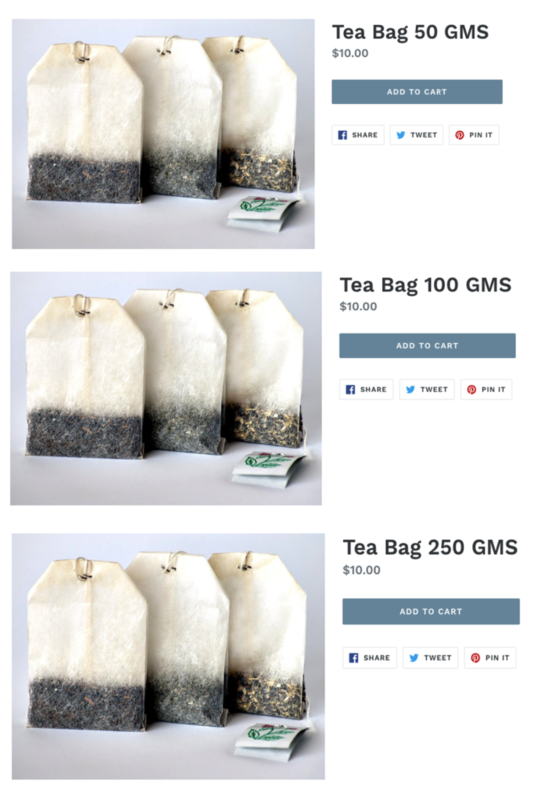 Now in the Product Kits app, select the master product as Tea Bag Bundle 50 GMS and attach the child product Tea Bag 50 GMS with their respective quantities, i..e, 1, 2, and 5. In this case, the app will automatically calculate the inventory of all the products.